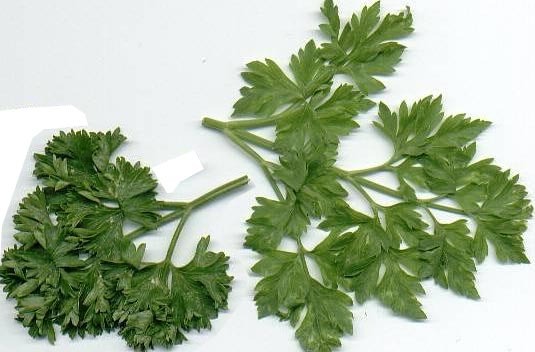 Medicinal uses: Fresh leaves are highly nutritious; seeds have a stronger diuretic effect than the leaves, can be used in the treatment of gout, rheumatism, and arthritis; the root can be used for flatulence, cystitis, and rheumatic conditions; parsley can promote menstruation both in stimulating a delayed period and in relieving menstrual pain (Chevallier 245). Nutritional information: Parsley is extremely rich in a large number of nutrients, chlorophyll, and carotenes. It is a very good source of vitamin C, folic acid, and iron. It is also a good source of minerals, including magnesium, calcium, potassium, and zinc as well as a good source of dietary fiber (Murray 220). Additional uses: Infusions of parsley leaves and stems are said to be soothing and cleansing when added to bathwater. The oil is used in a variety of skin care products (Kowalchik 408). Cautions: Excessive doses of seeds are toxic. Do not take the seeds during pregnancy or if suffering from kidney disease. Parsley is best avoided for nursing mothers as it can dry up the milk supply (Chevallier 245).